So David and I have been running away from this hurricane for the past day. We were lucky enough to scuba dive the blue hole before the bad weather came in, so we were fortunate. David got in his Belize tennis game, his goal is to visit and play tennis in every country. We made our way to the ruins Tikal Guatemala after a pretty easy border crossing, sure beats my last crossing where there were over 300 people trying to cross just like me. 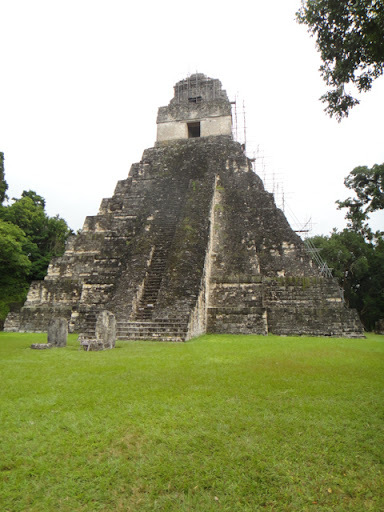 This used to be the capital of the Mayan empire. On the way to Santa Elena, I hit the coolest of all mile marks, the 123456….. Maybe I was bored…I don’t quite know. We got a good hotel room where we met a fellow biker from Venezuela, who was nice to share some maps with us. He was a professional sky diver with 9000 jumps; you might just see us in Venezuela skydiving at some point in time off Angle falls, the world’s tallest waterfall. As we drove through more of Guatemala, we took a lunch break and visor cleaning break. As we made our way through more of northern Guatemala, we saw the devastation of the massive rains the past week. It took out the entire town near Las Posadas; the town had become a lake where underneath lied the city. But it made for some killer fishing. We arrived in Lanquin late at night missing some bolts from the bumpy gravel road we drove all day long. Our hostel was awesome, for just $5US a night! The pit of death, apparently 3 people in the past 15 years have fallen in, one took 7 days, the others 20 and 45 days for the body to come out of the crazy mess it must be inside underneath the limestone. Less than mile from Semup Champey is a cavern system. The cavern system was the coolest I’ve ever been in as well David. You have to crawl, swim, rappel, climb through the darkness through this cavern with candles, it was an amazing adventure! The following day we headed to Antigua, and for the first time in my travels, spotted another Chacon! Arriving we made it the Day of the Dead Celebration in Antigua, it was neat. We packed up our bikes as for the next week we are in Antigua where David will be learning Spanish at a school and I will be volunteering at a local hospital, so until next time, adios!